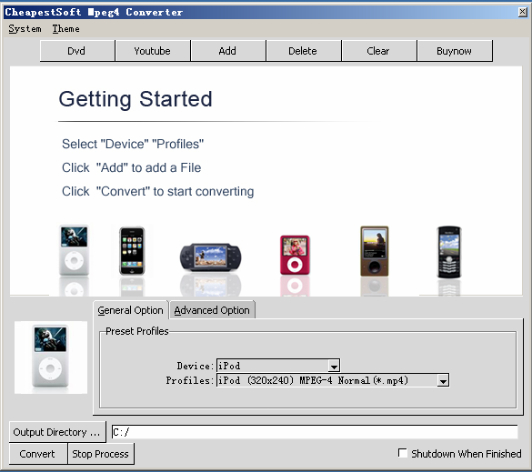 Cheapestsoft Mpeg4 Converter is powerful, versatile video conversion software Include functions of video to Mpeg4 converter,DVD to Mpeg4 converter,Youtube to Mpeg4 Converter.It is an all-in-one mpeg4 video converter to convert both DVD media and various video formats to iPod, PSP, 3GP, MP4 video/ movie. It suppots most of popular video formats, such as DivX, XviD, MPEG, MOV, QT, VOB, 3GP, WMV, ASF, or AVI, etc. ...... Download you favorite video directly from YouTube, Download and convert at same time. * Convert popular video formats to Apple iPod Video. * Convert popular video formats to Sony PSP. * Convert popular video formats to Microsoft Zune. * Convert popular video formats to MP4 format that can be played on general portable video device, such as Archos, iRiver, or Creative Zen Vision, or other MP4 player. * Easy to use - Just two clicks, everyone can become the master of Mpeg4 Converter. * Automatically shutdown the computer after conversion. Qweas is providing links to CheapestSoft MPEG4 Converter 1.0.6 as a courtesy, and makes no representations regarding CheapestSoft MPEG4 Converter or any other applications or any information related thereto. Any questions, complaints or claims regarding this application CheapestSoft MPEG4 Converter 1.0.6 must be directed to the appropriate software vendor. You may click the publisher link of CheapestSoft MPEG4 Converter on the top of this page to get more details about the vendor.